If you are being affected by workplace bullying and discrimination at work you may find it is causing you a lot of stress as well as having a negative knock on effect on your self-esteem and confidence. So what are the signs of workplace bullying and discrimination? Being yelled at, insulted, and put down? Having a co-worker talking over you at meetings, criticize you, stealing credit for your work or isolating you? Do any of these workplace bullying tactics sound familiar to you? Work bullying will lead the victim to experiencing symptoms of stress, decreased motivation and feeling worthless. This then can lead to the employee experiencing insomnia, anxiety and depression which can result in more sick days being taken. CIPD estimate that bullying costs UK employers upwards of £2 billion a year with 13.7 million working days lost every year as a result of stress and depression in the workplace. Anyone can be affected by workplace bullying but according to the UK National Bullying Advice Line, the largest number of callers that were seeking advice is those from the public sector such as teachers, nurses and local government workers. Research has also shown that women and ethnic minorities are also common victims of workplace bullying. However, workplace bullying can occur to anyone so what actions can you take? The majority of bullying victims feel uneasy about speaking up. They fear it will make the situation worse or harm their reputation. However, there are clear practical steps that you can take to deal with the problem. Firstly try speaking directly to the person in question, explaining why you find the behaviour difficult to work with. If you don’t feel comfortable doing this, try speaking to another colleague or manager / supervisor informally. Keep a diary of all instances in which you are made to feel picked on, including the dates. It would also be helpful to keep emails and documents which give evidence of the bullying behaviour. If you wish to make a formal complaint you will need to approach your firm’s Human Resources Department or your manager with all your evidence and be able to explain the problem that you are experiencing. There is no legally binding process that you and your employer must follow when handling a grievance at work but there is an ACAS (the Advisory, Conciliation and Arbitration Service) Code of Practice offering guidance (see below for contact details). Your formal complaint must include all the details and evidence of the workplace. In this letter you can include how you would like your employer to resolve the situation. Your employer will call you to a meeting, where you are entitled to bring a colleague or trade union representative. You could also turn to a third party to mediate between you and your employer. ACAS (the Advisory, Conciliation and Arbitration Service) helps individuals or groups of employees to avoid or resolve problems in the workplace. Their helpline offers free, confidential and impartial guidance. You could also raise the issue with your sector’s trade union. Bullying at work will lead to stress and loss of confidence and you may find yourself being isolated. Talking to a counsellor or friend could provide you with emotional support throughout the process. Talking about the issue may help you understand what is happening to you and recognise the feelings that you are experiencing. Many victims of work bullying feel ashamed or embarrassed that it bullying is occurring to them. They stop believing in themselves and feel they cannot change the situation and often feel stuck. 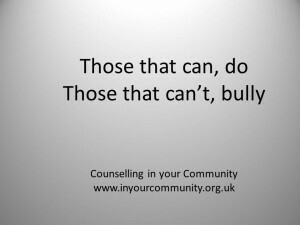 Counselling can help you explore your actions and think of ways of dealing with the situation. It can also find ways of rebuilding your self-esteem and confidence and support you through the conflict. Have you experienced workplace bullying or discrimination? What useful tips would you give to help someone?